Providing award-winning Anti-Virus, firewall, spyware, and online protection, installing McAfee software is the trusted, easy way to protect your files and personal information, download files safely, and get your computer running its fastest. #1 in threat detection of viruses, spyware and other malware, McAfee Active Protection technology instantly analyzes and blocks new and emerging threats in milliseconds. Unlike other security systems, McAfee is constantly updating itself so that your protection will always be current and there will be no gaps in your security. McAfee SiteAdvisor software lets you know about websites' risk ratings so that you can browse and download without risking your information or leaving your computer vulnerable to attack. If you're worried about installing yet more software on your PC, or long waiting times for scans, McAfee is for you. Fast full system scans won't slow you down, and the program doesn't use much memory. Rely on real time scanning to automatically protect you against threats to your PC. Enjoy fast subsequent full system scan time which won't slow you down. The McAfee QuickClean tool removes junk files that slow down your PC, and features a Disk Defragmenter to clean up your drives. 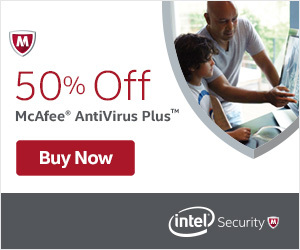 Right now, McAfee is on sale for 50% off. Customers will receive free setup, 24/7 tech support, and free removal of any viruses currently sabotaging your PC. Order now to secure and save with the #1 choice for PC protection.